So, here we are in the South Island of New Zealand..... This is a stunning island, and although I love the whole of the country, the South Island is my most favourite of the two.... It seems a lot more rugged and varied in scenery than the North... I am sure there are many of you who will disagree! ..... can you tell? 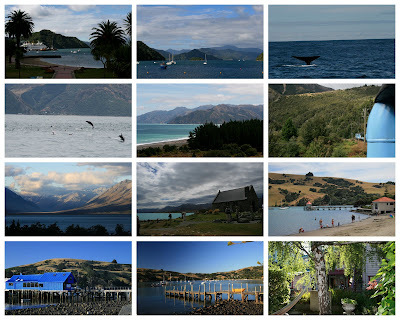 ... Akaroa was my favourite place... it's stunning! Hopefully, the story will continue tomorrow!!!!.... Don't hold your breath, I've not been good at this blogging for a while now... I do have great intentions, but life and work just gets in the way!!!! On another note, I have been very busy this last week... lots of sewing (and mess making) which I will show you tomorrow.. (not the mess though... you'd throw your hands up in horror!!) My back is beginning to feel better although it feels very fragile. One of the changes that I am going to make as a result of having spent a week on my back is to take time to look after me!!!! It's not an easy thing to do... everything and everybody else usually come before me, but, I can't take anything for granted now and I definitely don't want to go through that again. So, I have enrolled in a pilates class and am also intending to try to swim several times a week to strengthen my core muscles. You can ask me how it's going if you like just to shame me into keeping it up!!!! Hope to catch up with you again tomorrow.. I hope the back is getting better. Pilates may be very helpful. Look after your core!